Live a Colorful Life: It's Just Ghastlie! Last fall when the Moda Modern Building Blocks pattern arrived, I had originally thought I would do it similar to the pattern--in solids. 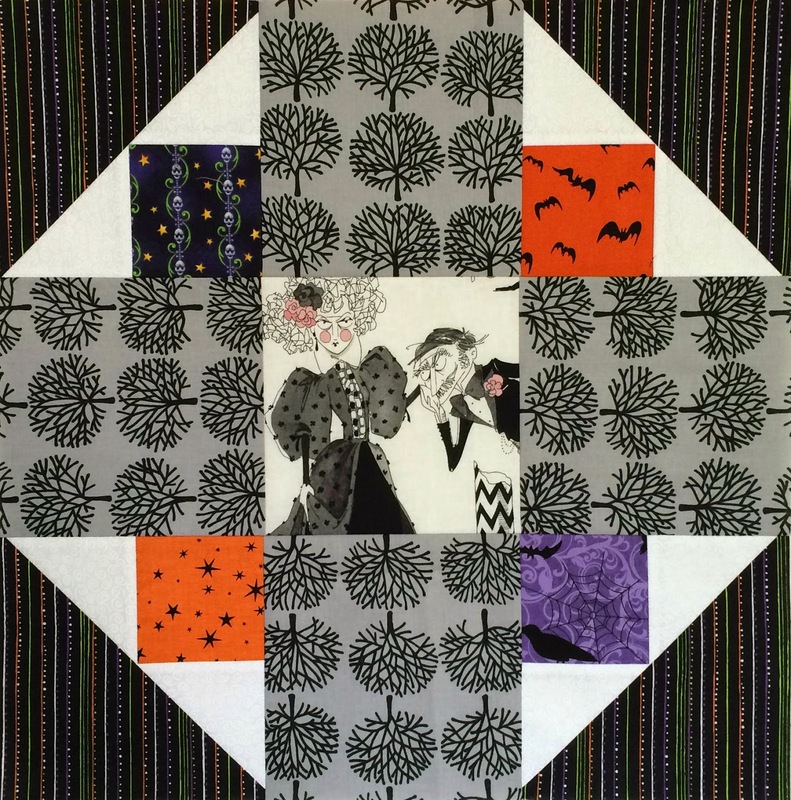 I love solids But then I looked at my stash of Halloween fabric and changed course. And then I found my little bit of Ghastlies fabric and changed course again. So all of the cute novelty fabric just didn't seem to work with the crabby Ghastlie family and I ended up using a lot of my regular stash--orange, purple, lime green, grey and black. I posted progress pictures along the way. It turns out that when making scrappy quilts, with piles and mountains of fabric strewn all over the place, I am highly motivated to actually finish the project, no matter the size. I'll have to keep that in mind! So I'm happy to present the Ghastlies, completely quilted and in all their glory. We have had some really foggy days around here and I was trying to capture that when I photographed the quilt. You can kind of see the ghostly trees in the background. I have heard rumors that 2014 was the last year for any new additions to the Ghastlie line of fabric. So while I had intended to use only my stash, I bought one yard of the current line from 2014 to add to the back. And included a bit of the selvage. I'm thrilled with the quilt. 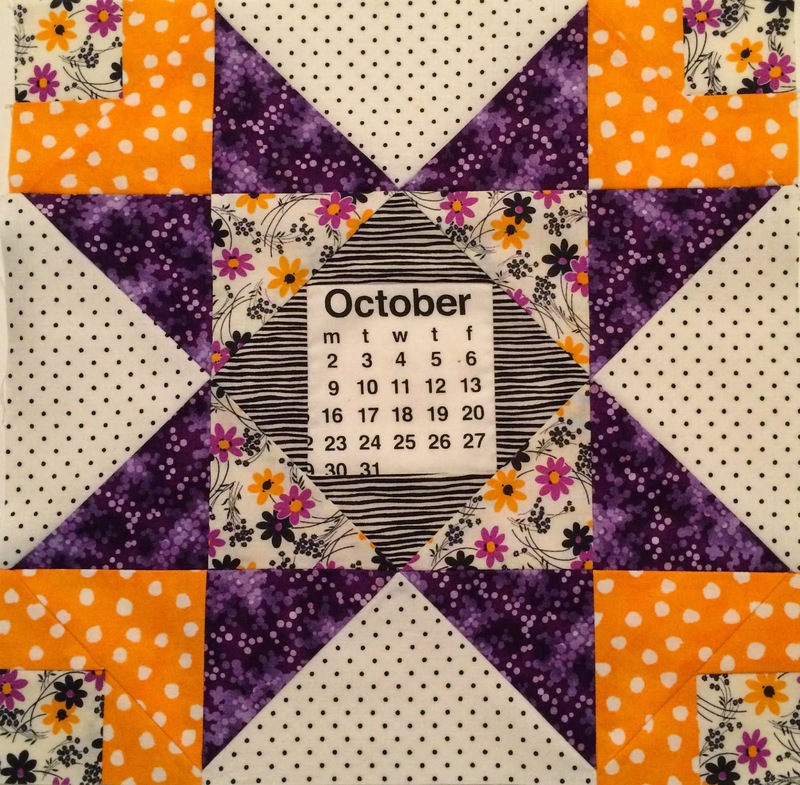 It was beautifully quilted by someone I was following on Instagram, Darby from @quiltedsquid (quiltedsquid). It turns out we live less than an hour apart! I'm linking to Amanda Jean at Crazy Mom Quilts and TGIFF. oh, lovely! I much prefer your version to some of the solid quilts I've seen in that qal. Lots to look at here, but the blocks are related to each other. Wow! That turned out so different, in such a fun way! Hooray for a new, close quilting friend! It is really cute! Love it! 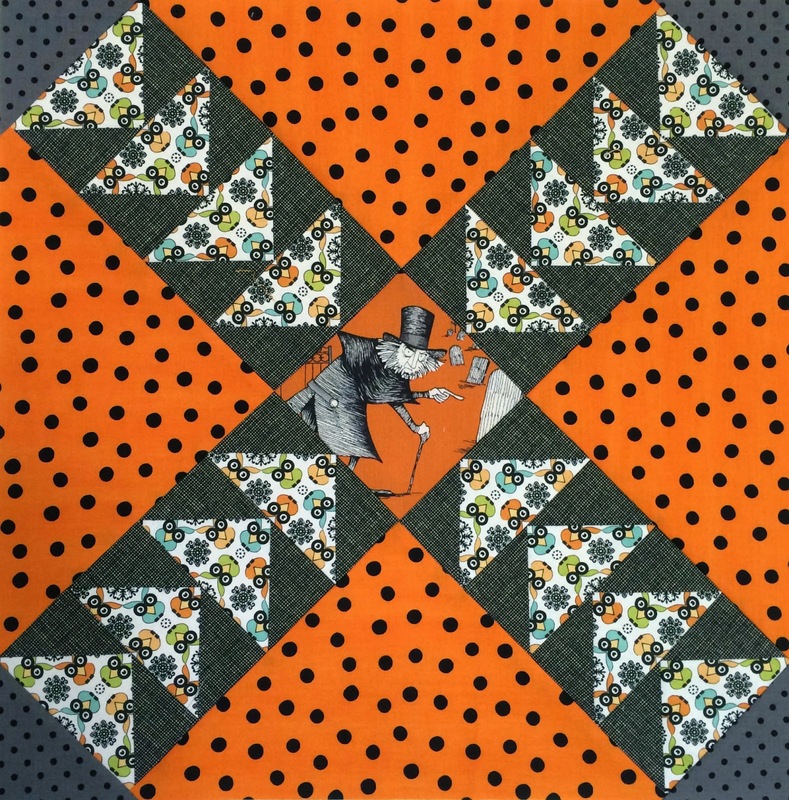 This is an extremely interesting quilt! Love your selections of fabrics and the different settings the ghastlies are in. Great quilt! Great quilt! 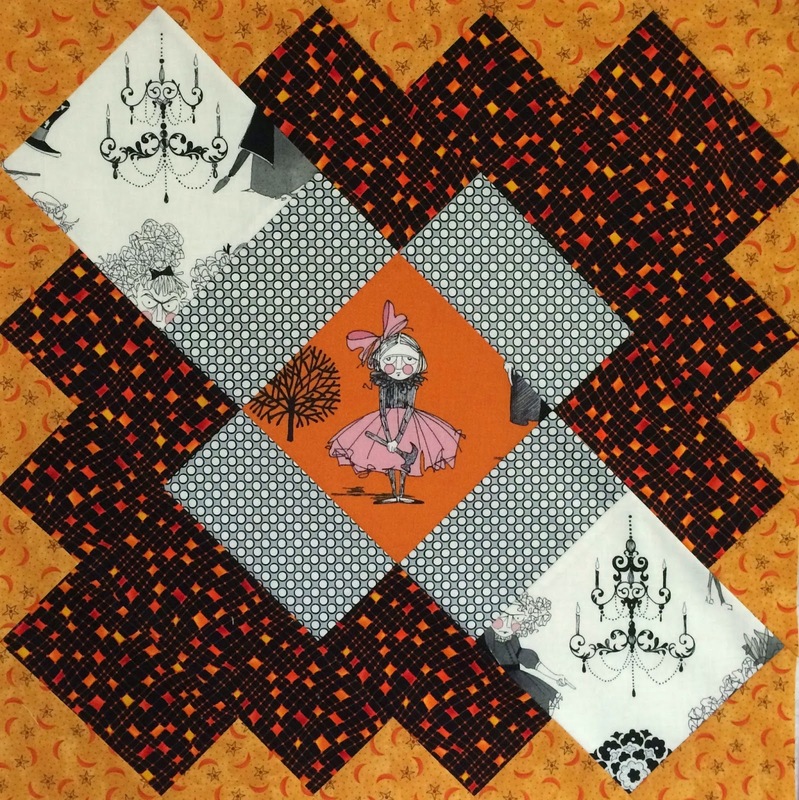 I love the personality in each of the blocks, and the fabrics from your stash worked so well with the Ghastlies. Thanks for linking to TGIFF! This turned out so great, Cindy! I think that 2014 might be the year of the Finish for you!! I love it too. I'm such a huge Ghastlie fan. 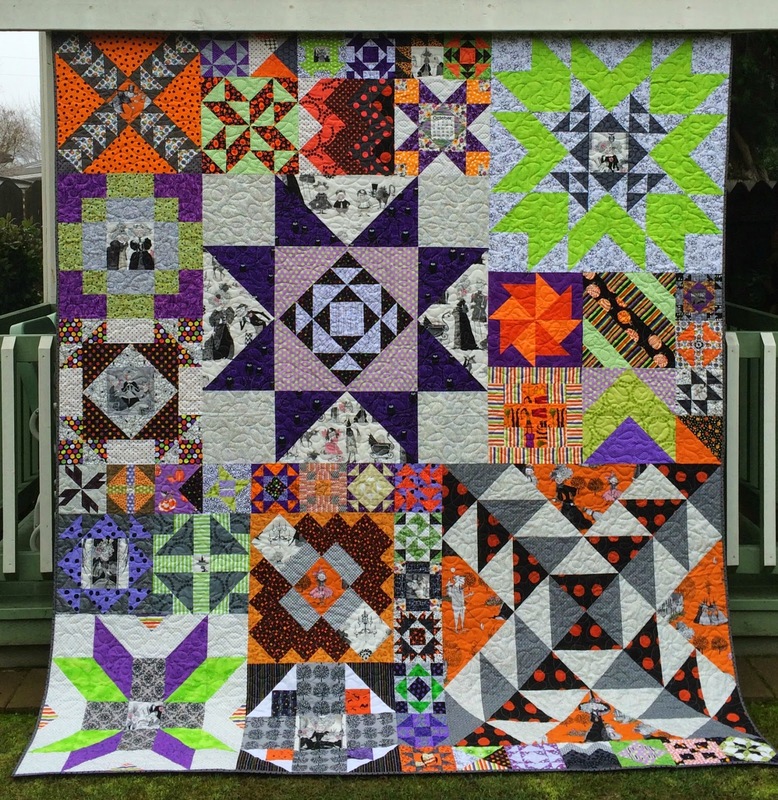 I'm hoping to get my big Ghastlie quilt made sometime this year too. I just read about your de-stashing last year. I have been in this situation this past year. I think online stores have really become a big candy store! I took 4 large IKEA bags full of fabrics to a retreat last fall. I put a tip jar in the middle of the tables and asked for donations to our local Children's Hospital. Over three days, the quilters donated $400 to the cause and took away all the fabric. I will be doing the same thing this spring. I also donate to Project Linus and Quilts of Valor - and I still have plenty of fabric to make quilts for new babies, kids who need some love and just because I want to quilt. It is my life. I've seen a lot of these Moda pattern quilts and yours is the best as it shows an original twist on the pattern. Thanks for sharing. Love it! I'm not sure which block i like the most as they all so visually interesting and the fussy cutting is brilliant! Super fun! I actually hesitate to make scrappy stuff because of the scrapplosion that happens in my sewing space. Superb to see those Ghastlies in a ghostly setting. Really terrific. You are on a roll this year with all your finishes! Congrats!